With school starting up, I thought I’d share the most interesting icebreaker I found last year. Copy, cut, and pass out these half-sheets [pdf]. Each person in a group picks a dot and writes her name next to it. Now the group’s job is to label the axes. Physical attributes don’t require all that much thought and don’t reveal all that much, so don’t allow them. That’s it. It requires a surprising amount of creativity and conversation. Happy first day of school, teachers. Previously. This Who I Am sheet, which I adapted from my first student-teaching placement, has been popular. 2013 Aug 7. I am informed by Marty Joyce this icebreaker is from the College Preparatory Mathematics series. 2013 Aug 9. Rachel Rosales used the Math Forum’s Noticing / Wondering framework on her first day. I learned this from Carlos Cabana, at the Creating Balance conference at Mission HS in SF. I’ve used it with much success for a couple years now. Be aware, however, that it can surface issues you might not be prepared to deal with. I teach at a private school, and there is huge income inequality between my kids’ families. This year, a group labeled one axis “number of bathrooms in my house” with the two quantities being 4 and “more than 4″. In my surprise, I don’t think I handled it well to support the kids in the class who might have just 1 or 2 bathrooms in their house and suddenly had their lack of wealth put in their face in math class. I’ve used your “Who I Am” sheet for several years – after reviewing them, I file them away, then surprise students on the last day of school by returning them. They giggle at how much they’ve changed in 9 short months, often barely remembering filling out the page in the first place. The “self-portraits” are always a favorite to revisit. I thought I would share with you an activity that I stole from you and adjusted a bit which worked out very well for my first day freshmen Alg students. I read your Personality Coordinates Ice breaker activity and made a little twist. I put the x and y axis on the ground and used the classroom for students to move around. I gave them different labels for the x-axis and y-axis and let them move around the room and meet each other and see who was similar to them and who was different. I used labels like desire to read, distance traveled this summer, and # of hours you sleep each night. It lead into some good movement and good discussions of where students traveled over the summer, what they read, etc. The best graph was “love for math” vs “desire to get better at math.” After they moved around I categorized students into ones that were going to be my project to get them to like math, ones that would be easy to teach, and the rest I was going to push further away from the origin to get them to love math more. A related icebreaker, for when you’re in a group of 2^n people, is to come up with n yes-or-no questions so that each person has a different set of answers. I’ve done it a bunch with groups of 8, and it’s a really nice challenge. I love the openness in this! The note about physical attribute is an important one — might lead conversations down the wrong path. 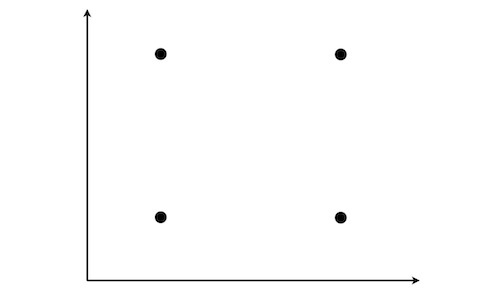 Thinking maybe I could draw the dots in other configurations too: parallelogram-ish, elongated rectangle, rhombus, or triangle if 3-person group. Be aware, however, that it can surface issues you might not be prepared to deal with. I teach at a private school, and there is huge income inequality between my kids’ families. This year, a group labeled one axis “number of bathrooms in my house” with the two quantities being 4 and “more than 4”. In my surprise, I don’t think I handled it well to support the kids in the class who might have just 1 or 2 bathrooms in their house and suddenly had their lack of wealth put in their face in math class. @Laura, thanks for the caveat. I’ve added it to the body of the post. I use a similar activity using the coordinate system. positive x is hard working, negative x is lazy, positive y is rocket scientist and negative y is standard door know. Students then answer these questions. If individuals were placed at some coordinate location on graph describe the type of person would be located at the origin (0,0). What type of person would be in the first quadrant? What type of person would be in the second quadrant? What type of person would be in the fourth quadrant? Give the coordinates of the point where your parents would place you? Explain why your parent would place you there. Give the coordinates of the point where your best friend would place you? Give the coordinates of the point where you would place yourself and write a paragraph about why you belong at that point. Don’t most houses just have one bathroom?? Give students a set amount of time, like 3-5 minutes. They need to common up with a favorite book, game, and movie. Look all the ways groups need to work together to get solve a problem! That is what happens in the work world…I love how real it is. My bad, thanks for the great idea as usual. Looking forward to adding the personality coordinates this year. Thanks! I did this activity today with an 8th grade standard class and an 8th grade gifted/accelerated class. Loved the results from both! For the standard classes we had them create a “Me Graph” first, such that the half sheet only had them on it and they created the axes solo. Then their team used poster paper to create a “We Graph”, following Dan’s original instructions. This was a great stepping stone for a non-gifted mind! Thanks for the icebreaker Dan! I’m totally going to assume you did this on purpose to coordinate with our middle school blog topic this week! ;) It posts on Sunday. I did something similar once in an exercise on teamwork/groupwork and it worked pretty well (but it does require time to be effective!). I also wanted to tell you that not only do I use your “who I am” sheets every year (first day homework), but I’ve started scanning them in. So I have them digitally for all the kids I’ve taught since I started scanning them. Which is cool! I only return them to seniors (so if they have me as sophomores, they won’t get them back unless they have me as a senior), and on the last day of classes. I put them in an envelope with a “senior letter” I write to them. It’s hilarious to watch them pull it out and laugh at everything. And if I had them in previous years, I print out the copy of their “who I am sheet” from that year too and stick it in the letter. What’s interesting to me is how constant their responses are from year to year! I had some kids in 7th, 10th, and 12th grade — and their sheets are so similar! One last thing I do with seniors is that before I give out the letters… I make a smartboard with their self-portraits (all of them (but no names), even the one blank one that I always get turned in). One by one, I project them, and have students silently try to guess who is who… How well do the seniors know their class (and the kids in the other calc class also! because why not!)? It’s totally fun for me to watch them. Especially when their own self-portrait is projected on the screen and they exclaim WHO IS THAT?!? Can you give some examples of axes that some students suggested? Lenny (#6), I’m not a rocket scientist, but on the other end of the spectrum, what is “standard door know”? I love this. Thanks so much! I think I’m going to use it as 2nd day activity with a remedial 9th grade class. On the first day, I will take the whole class into the hall way and have them arrange themselves on a 1-dimensional ‘number’ line according to certain attributes. That way they’ll have a better idea of how to do it 2-d the next day. Will probably also use that opportunity to teach some number sense – give them decimals and have them space themselves according to size. @MaryAnn Moore, Tell us more about how they line up in 2D the next day. What’s a example of how they might arrange themselves? Finally located the NCTM “media clip” for the “resume” – with coordinate categorical/measurable variables…http://www.nctm.org/publications/article.aspx?id=17999 Probably needs a classroom “PC” update. Also could be used as a pre-post unit or year self-reflection. So – I’m still confused by the personality coordinates activity….could you send me one that is filled out or give me more of a description please? thanks! i am still confuse with this ice breaker activity …:(…… i want to use it in workshop …..can u plzz send me one that is filled or send its description ……?……..thanks.